There's also a touchscreen hybrid watch and a watch-like activity tracker. Garmin's smartwatches are still largely focused on fitness, but they're learning a few new tricks -- and in one case, they don't need your phone to do it. 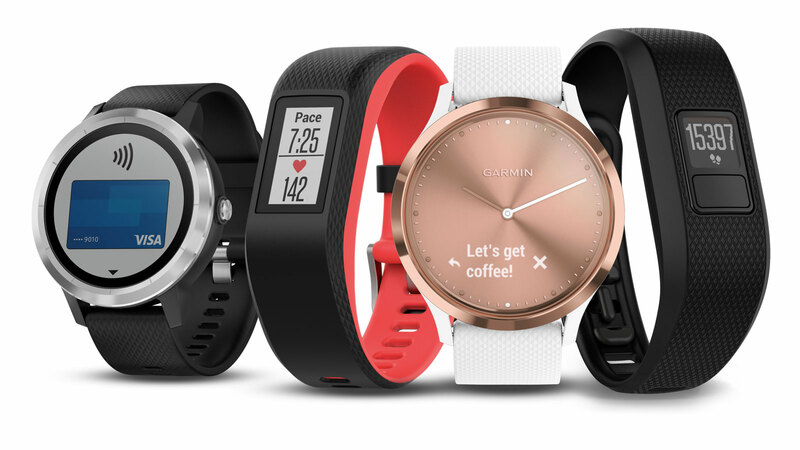 The company has unveiled a trio of Vivo smartwatches headlined by the Vivoactive 3 (far left), which introduces Garmin Pay. As the name suggests, it lets you make tap-to-pay purchases without your phone, much in the same way you would with an Apple Watch. If you want to buy an energy drink as the reward for a long run, you don't have to carry anything in your pockets. The technology requires an eligible credit or debit card from MasterCard or Visa, so you'll want to check the support list before you leave your phone behind. There's more to it than shopping, of course. The Vivoactive 3 adds a "Side Swipe" control that lets you quickly scroll through the interface (akin to the Apple Watch's digital crown). There's an always-on Chroma display that should be visible in broad daylight, but still promises a full week of battery life as a smartwatch and 13 hours with GPS running. And like any Garmin watch, fitness is the top priority: it has a heart rate monitor to gauge performance traits like your VO2 max, and 15 sports apps for tracking everything from elliptical workouts to yoga. Garmin is selling the Vivoactive 3 through Best Buy at $300 for a black or white model with a stainless steel trim, or $330 with slate trim. UK pricing will be £280 and £300, respectively, when all new Garmin wares launch later this year. If you want something that's a tad more stylish than a fitness watch, you're covered. Garmin is launching a second-generation Vivomove, the Vivomove HR, that promises to be more useful both as an activity tracker and as a smartwatch. There's now a heart rate monitor, as the HR badge suggests, but the big party trick is a hidden touchscreen -- while this looks like a conventional watch, its hands will move away when you receive a text message or check your BPM. There's no GPS, but you still get a water-resistant design (at least, with a silicone strap) and a 5-day battery life while in full smartwatch mode, and two weeks as a plain watch. The Vivomove HR goes for $200/£170 in a Sport version and $300/£250 for the leather-toting Premium version, and there are case options ranging from plain black to stainless steel and gold tones (including the rose gold you see above). The last device, the Vivosport (second from left), is really more of an activity tracker that behaves more like a smartwatch. It's very much a fitness band, but it has an always-on color touchscreen, takes notifications and even has a LiveTrack option that lets friends and family see where you are in real time thanks to built-in GPS. You'll find a heart rate monitor here as well, and it can track activities like cardio or strength training as well as sleep. It's available for $200/£170.